I’ve just done a test of the latest tweaks and feel like the game is finally taking shape. 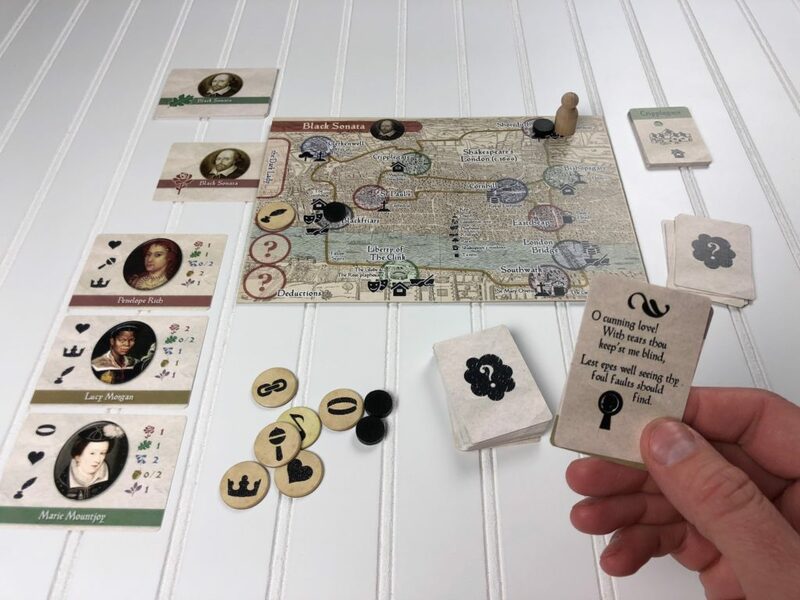 The main game is working reasonably well as a chase around Elizabethan London, circa 1600, visiting eleven sites associated with Shakespeare’s life. A deck of around 30 cards governs the secret movements of the Dark Lady and once you deduce where she currently is you need to give chase with your own pawn until you can intercept her and gain a clue. If you’re too slow she can escape you. I am figuring out what extra cards to add to the deck to spice it up and gradually ramp up the difficulty over time. There’s still a lot of balancing to do, but for the first time I’m starting to feel like it might be possible to get some rules and components ready in time for the volunteer playtesters at the end of the month. Hurrah! Tonight I completed a first draft of the rules and have almost got a complete low ink version of the components. Writing out the rules was great because it helped identify some places where simplifications could be made. The game is basically made of two halves: a hidden movement part where you must deduce the location of the Dark Lady to earn clues, and a “Mastermind”-like part where you use those clues to deduce her identity. Each part is complete and has had some testing, but what is missing is the glue to hold them together. Fortunately I have some glue, in the form of the sonnets themselves, but now I need to tune the various bits to make sure they play well together. This will probably take a couple of days, but I’m determined to be Components Available in time for the volunteer tester deadline. Putting the theme of this game together has involved quite a lot of background research. Over the last month or so I have read Bill Bryson’s biography of Shakespeare, trawled the web for info and portraits of the candidate Dark Ladies, wandered around the earliest extant maps of London, pored over online reviews of Shakespeare themed tours, and of course read and reread all 154 sonnets, especially those relating to the Lady. She has occupied most of my free thoughts, and she stalks my dreams… Above all, I have continually sieved and sorted facts (of which there are few) from wild speculation (of which there is much). Through all of this I have assembled some notes on the lives of Shakespeare and his contemporaries, with a special focus on the question: Who was the Dark Lady? To be honest, I don’t really believe there was a single Dark Lady that Shakespeare biographies in his sonnets. And the game would less interesting if there were. Instead I think she is probably a half-truth created from several of the women that crossed Shakespeare’s path, together with a healthy dose of fantasy. But that doesn’t detract from the exhilaration of the hunt! Anyway, for anyone who is interested, I have sorted and formatted my notes into a booklet which you can download here. The pages are sized for printing A5, that is two pages per side of A4 or letter paper. If you print in booklet format it comes to six double sided pages in greyscale/low ink. Or they should look good for reading on your tablet etc. So if you’ve ever wondered exactly where Shakespeare lived during the plague of 1603-04, or what sort of place is called The Liberty of The Clink (seriously, no nation can top the English for interesting placenames; my personal favourite is the village of Nempnet Thrubwell), or whether an African woman might have attended Elizabeth I only to show up a few years later as the Madam of a notorious brothel… Well, if you are as fascinated with history as me, then you might like to check it out. If nothing else, it will give some meaning to the places and people named in Black Sonata.